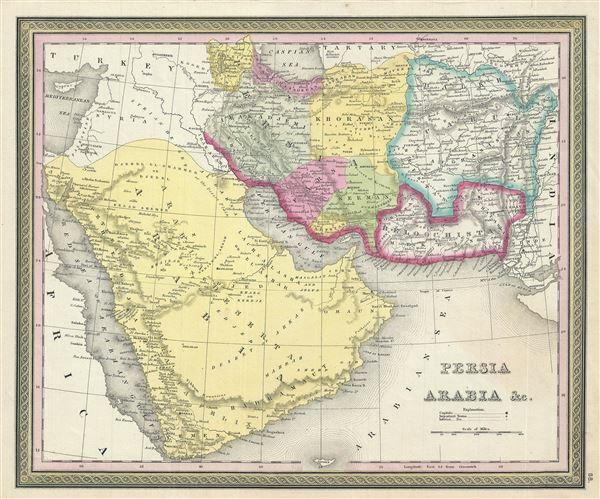 A fine example of Thomas Cowperthwait and S. A. Mitchell's 1850 map of Persia, Afghanistan, and Arabia. Centered on the Persian Gulf, this map covers from the Mediterranean and Red Sea eastward as far as India, including all of modern day Saudi Arabia, Israel, Jordan, Syria, Iran, Iraq, Kuwait, Afghanistan, and parts of Pakistan. Mitchell offers a wealth of detail throughout, identifying mountains, deserts, rivers, springs, caravan routes, cities, towns, forts, and an assortment of additional political and topographical elements. The whole is engraved in Mitchell's distinctive style with green border work and vivid pastels. Political and topographical features are noted and color coded with elevation rendered by hachure. This map was prepared by S. A. Mitchell for publication by the Philadelphia firm of Thomas Cowperthwait & Co. as plate no. 68 in the 1850 edition of Mitchell's New General Atlas. Rumsey 0537.066 (1846 edition). Phillips (Atlases) 814. Alai, C., General Maps of Persia 1477-1925, E-379.